I have been on quite a Middle Eastern flavors kick recently. I think it is the cooler weather – which I actually don’t mind because it means warm spices, big bowls of soup, cozy sweaters…granted it is October, come March I will most likely be a little less enthusiastic. I made this for my monthly potluck dinner with a group of girls from high school – well actually most of us went kindergarten through 12th grade together. In a class of 40 girls. Yes ALL girls. And yes we still like each other! We rotate apartments (I am planning on hosting the next one, once I get a real table and something other than plastic folding chairs to sit on) and everyone brings something – the non-cooks usually bring cheese, wine, or dessert. Arguably the most important elements to any meal. Given that this dinner would most likely be washed down with a healthy dose of pre-halloween candy, I thought I would offer something healthy to start. It was a hit. I believe a spoon was even used at one point when our provider of crackers and crudité arrived fashionably late. 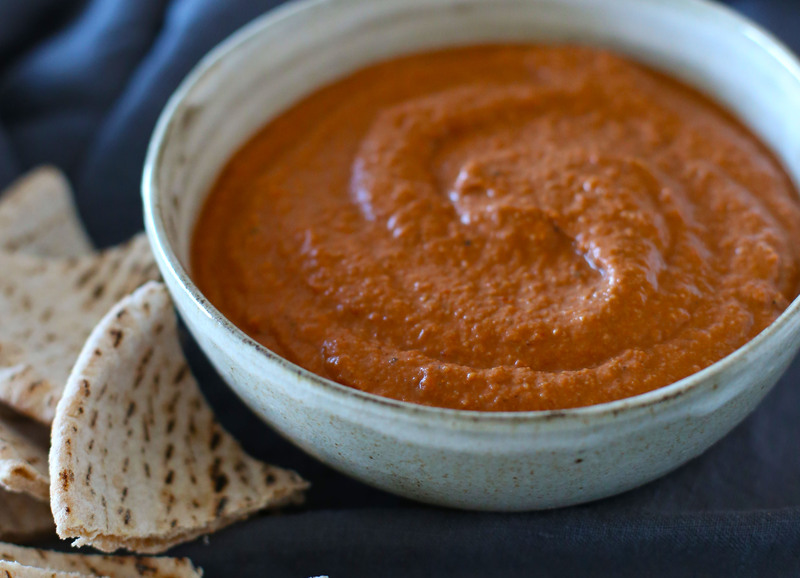 Muhammara comes from Syria and is eaten as a dip with pita or as a sauce for kebabs. I would also add that it makes a delicious addition to any sandwich – like the one I lovingly prepared at 7am for Chris, with leftover roast chicken, gruyere, and avocado. Usually when I make something new he sends me a text saying how tasty his lunch was (or occasionally offering constructive criticism when I accidentally blast his sinuses with a little too much horseradish!) so his radio silence was a little suspicious. When asked he came clean that he forgot he had such a wonderfully prepared lunch and ordered food – I am sure he would have given it a rave review but you will have to ask the guy who sits next to him what he thought of the sandwich. Did I mention the bread was homemade? Roast bell peppers over a burner to char - once skin is blackened place pepper in a bowl and cover, letting the peppers steam for 10 minutes. 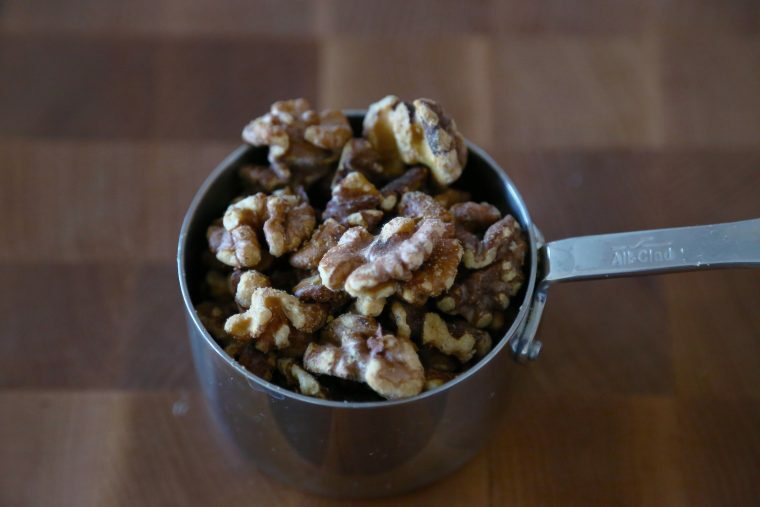 Combine all other ingredients in a food processor. 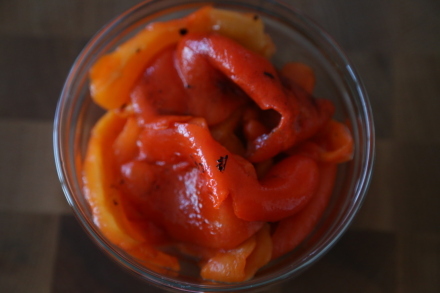 Remove charred skin, seeds, and stems from bell peppers and add to the food processor. 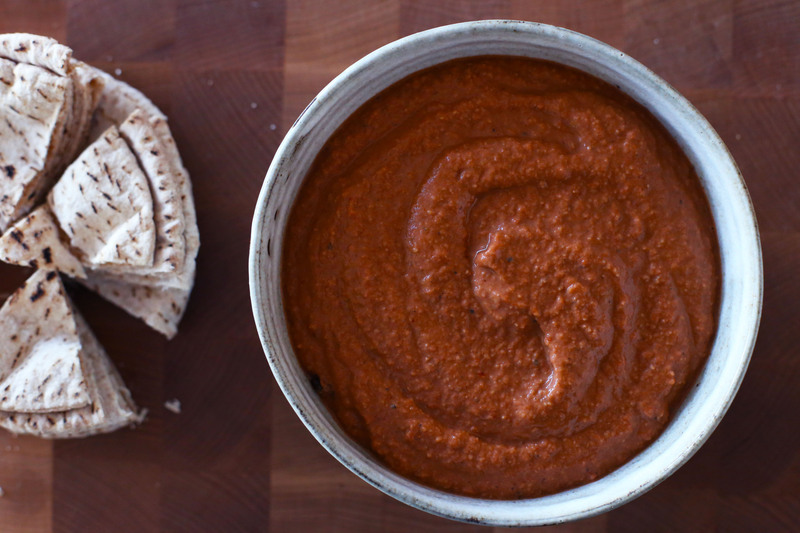 Puree and taste for seasoning. Serve at room temp with pita or fresh veggies - anything that can carry a nice big scoop to your mouth. !